I love the deep black of the AMOLED Clear Black Display. It blends to the whole phone. Once the most popular game in the world (not sure if still is or if that’s now Angry Birds), Snake is possibly the most legendary mobile game in the world. Last year we saw an app on iPhone that tried to replicate not just the game, but the phone itself to give that full blown experience. 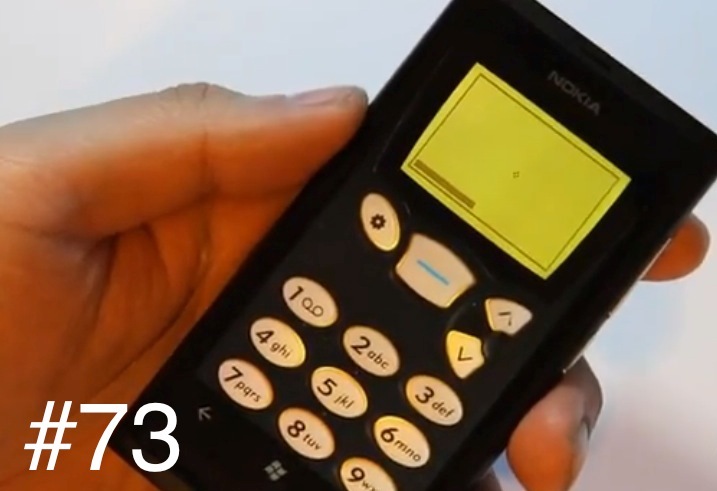 Nokia Conversations posted about such an app for our Nokia Lumias called the Snake ’97. It’s a great little app that replicates a classic Nokia, can you guess what it is? (5110) . The buttons themselves work great, very responsive and they have a little vibration when you press them, kinda like proper haptic feedback – something I miss from N9. You get the so very memorable ‘drrrrrt’ sound when you hit a wall. This is Snake 1 where the walls are solid. The app has a trial so you can give it a go first before paying. I like this feature from a lot of the marketplace paid apps as sometimes I’m weary of paying for something I might not like. It is as addictive (and frustrating) as the original, play Snake ’97 and be prepared to loose some productive hours. – in trial mode you can earn up to 250 points! The story behind this game is that my modern smartphone got damaged in an Amsterdam bar…, requiring me to revert back to an old phone. Suddenly I knew the modern smartphone was missing something and the idea for a accurate Snake remake was born. Snake ’97 is an homage to the classic mobile phone game programmed in 1997. By carefully analyzing the classic gameplay, timing and controls, this Snake ’97 remake is one of the most accurate available.